Do you have trouble keeping your eyes on one line of text or moving from one line to the next? of it before you start. index finger method or dusting method helps keep you actively involved. parts (paragraphs, pages, sections, or chapters). You’ve probably heard that reading in poor light will ruin your eyes. New research shows that’s probably not true, but reading under good light makes the process a lot easier. Use diffuse lighting. This means light should fall on the page from several sources. 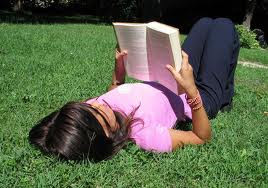 Find a place to read where you don’t get a glare off the pages and try not to have any shadows on the page. This is important when reading for information or for school. 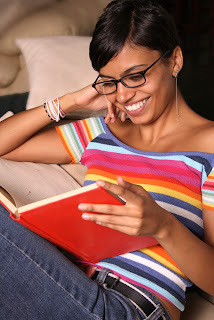 If you are reading for pleasure, you don’t have to finish reading a book you find boring or too difficult. When reading for your own personal pleasure, never force yourself to read anything that you find boring. Try the first 15 or 20 pages of a novel. If it doesn’t catch your interest and you are bored, stop reading immediately. Don’t feel guilty for not having finished a book. If you don’t like it, put it down and find another. The world is full of wonderful books. Often you have to start several books before you find one that is entertaining to you. which rely on glue to hold the pages together. 5 Read what you enjoy. When reading for your own personal pleasure, never force yourself to read anything that you find boring. Try the first 15 or 20 pages of a novel. If it doesn’t catch your interest and you are bored, stop reading immediately. Don’t feel guilty for not having finished a book. If you don’t like it, put it down and find another. 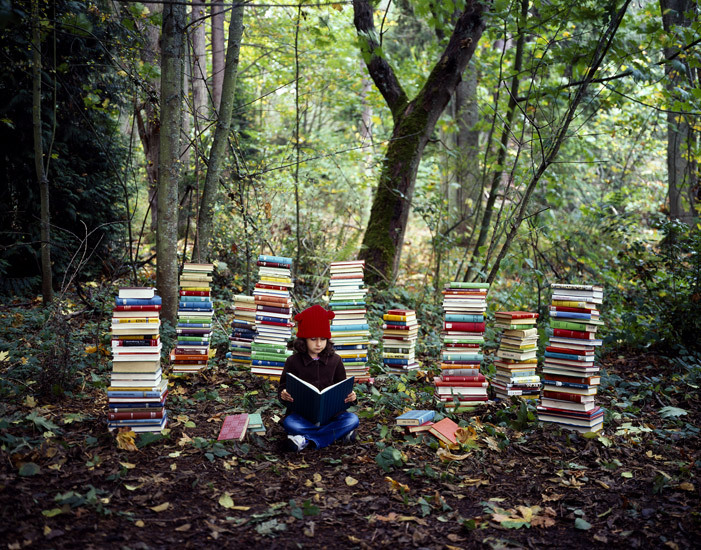 The world is full of wonderful books. Often you have to start several books before you find one that is entertaining to you. Previewing the text will give you a head start on understanding what you are about to read. Have you ever wondered what everyday objects are called, but been too busy learning " academic" vocabulary? Here's a fun new word game I have recently discovered called "Name that Thing." The game, on the Merriam Webster dictionary website, is a visual vocabulary quiz of the names of everyday objects. Unlike most word games, it uses pictures to test your knowledge of words. If you have five or ten minutes to spare, it is a great study tool to help you build your vocabulary by learning the names of everyday objects for kitchen tools such as a kitchen whisk, or common things you see on the street such as store awnings. It will also help you feel much less frustrated when you want to refer to "that thing you turn eggs over with when you are frying them" by its correct name. 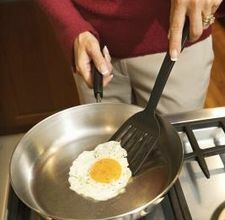 By the way, that thing is called a "spatula." Click here for the website: Name That Thing . and at least a dozen more. You can even create your own personal word list. Listening Quiz Video History of Valentine's Day Quiz Lover Ever After is a is a slide show from TIME Magazine where couples who have been married fifty years share their secrets for making love last. Read Valentine's Day Around the World to find out how people celebrate Valentine's Day in different countries. Send free Valentine's Day E cards : The National Wildlife Federation has many free Valentine's Day E cards you can send. Finally, here are a few love songs with listening activities that you can sing along to later. Whitney Houston, a very famous singer who sang beautiful love songs and sold millions of records died a few days ago, so I will start with her. I admit it. I'm a romantic. Everyone needs love in his or her life. I'd like to start with a few quotations that say a lot about the power of love. As I mentionned in my last post, Valentine's Day is not just for lovers. It's a day when anyone who cares for, or appreciates someone should let them know how they feel. This includes fathers, mothers. brothers, sisters, children, grandparents, friends, or anyone else. But there is no avoiding it. Today love IS in the air. Lovers will be giving their significant others roses and jewelry, or going out for candle light dinners. The radio is playing love songs all day long, and many of us are smiling at complete strangers just because it is Valentine's Day. So, who was St., Valentine and why do we celebrate this day Ferbruary 14th? Even historians can't seem to agree on the origins of Valentine's Day. One of the commonly agreed on stories is that the idea of Valentine's Day started in the time of the Roman Empire. In ancient Rome, February 14th was a holiday to honour Juno. Juno was the Queen of the Roman Gods and Goddesses. The Romans also knew her as the Goddess of women and marriage. The following day, February 15th, began the Feast of Lupercalia. In those days, girls and buys lived separately from each other. However, on the day before the festival of Lupercalia, girls and boys would both write their names on slips of paper and place them in a jar. Each young man would pick a girl's name from the jar, and spend the entire day of the festival with her. Sometimes this "pairing" would last a whole year, and often, they would fall in love and later get married. There have also been stories of three St. Valentine's. There is very little information about two of them, but the legend that has survived the longest and which historians seem to agree upon the most is the following one. Under the rule of Emperor Claudius II Rome was involved in many bloody and unpopular wars. Claudius was having a difficult time getting soldiers to join his army because they didn't want to leave their wives and families. Since Claudius felt thatr single men would be more likely to join the army, he cancelled all marriages and engagements and refused to allow lovers to get married. However, Saint Valentine, a Christian Roman priest in the days of Claudius II, refused to obey the emperor and continued to secretly pperform marriage ceremonies. Eventually, the Roman authorities caught him and put him to death. The Catholic church then made him a saint and gave him the special feast day of February 14th, the day he was supposedly executed. Another legend is that when the emperor Claudius put Valentine in jail, he fell in love with the jailer's daughter. Before he died, he supposedly sent her a letter signed "from your Valentine. " Valentine was pretty much forgotten until the 14th century when this Christian feast day become associated with love. According to UCLA medieval scholar Henry Ansgar Kelly, author of Chaucer and the Cult of Saint Valentine, it was Chaucer who first linked St. Valentine's Day with romance. 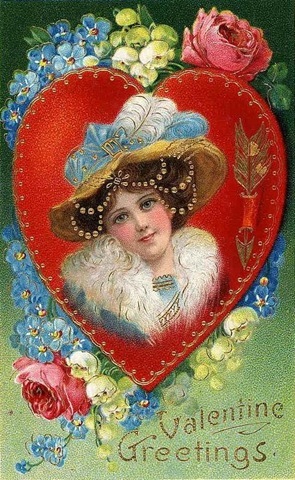 The holiday continued to change over the next few centuries, but by the 18th century it had become customary for lovers to exchange hand made cards and gifts on Valentine's Day. Americans soon picked up on this idea, but the practice did not become really common until Esther A Howland, began mass-producing Valentine's Day cards. Today, the holiday has become a huge commercial success. In 2009, Valentine's Day generated an estimated $14.7 billion in U.S. retail sales. Each year, people buy about a billion Valentine's cards, 100 million roses (in a 3-day period) and 35 million heart-shaped boxes of candy. The average consumer spends $77 on Valentine's Day gifts. Check out my next post for a few Valentine's Day links to have fun with. Many people assume that Valentine's Day is only for lovers. They think of it as a day when men and women tell their lovers, significant others, or spouses how much they love them. All the advertising focuses on lovers and the exchange of gifts such as jewelry, flowers and chocolates, or on romantic candlelight dinners. But, Valentine's Day is NOT just for lovers! Love comes in many forms. Some of us have partners, spouses or others whom we love in a romantic way. But, we also love our children, our parents, grandparents, friends and other people who have had a strong influence in our lives. 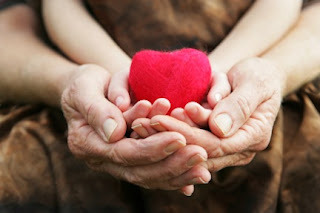 Valentine's Day gives us the opportunity to tell them that we also love and appreciate them. On February 14th,people in Finland celebrate Ystävänpäivä, which is translated as Friend's Day. In Mexico, it is called the Día del amor y la amistad, the Day of Love and Friendship. There is no doubt that Valentine's Day has been over commercialized in Canada and the United Sates, but it still remains a wonderful day when we can express love and appreciation to ALL the important people in our lives, including our children, our family and our friends. 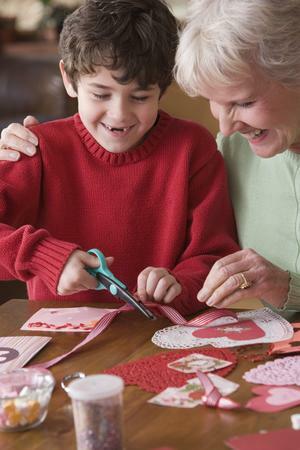 In almost every elementary school in North America, children make Valentine's Day cards for their parents as a way of reminding them that they love them. Why shouldn't we as parents return the favour - not just with cards, but with words and actions. My children know that I love them, but it never hurts to say it a little more often. I have always given them cards and chocolates on Valentine's Day, and there have even been years when we have celebrated Valentine's Day together as a family by going out to dinner. I have always telephoned my parents to tell them how much I appreciated them, especially after I had kids of my own and realized just how difficult it was to be a parent. Now that my father is no longer alive, Valentine's Day is one specific day when I spend time thinking about him and about how much I appreciate what he gave me. It seems appropriate to do this on a day that focuses on love. For many families, Valentine's Day evokes feelings that children may not know how to deal with. Divorced or separated parents may find this a good day to discuss feelings. This is a good opportunity to tell your children how much you love them, regardless of their living situation. It is also a perfect time to hear what your children have to say, to empathize with their emotions and have a real conversation about love and emotions. How about all the friends who have been there for us in good and bad times,and who have helped us get through some of the most difficult times of our lives? Don't they deserve a little expression of the love and gratitude we feel towards them? Of course they do. So, by all means send the love of your life a dozen red roses, or spend some intimate, romantic time with him or her, but remember to let the other people in your life know that they are important to you and you love them because Valentine's Day is not just for lovers. It's for everyone you love. What do YOU think? Is Valentine's Day just for lovers?? What do you do in YOUR original country, or culture? Let me know what you think. I value your comments. 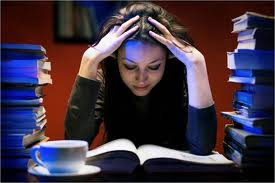 I've been thinking of all of you who are discouraged because learning English is harder than you thought it would be. You never seem to be able to write or speak without making mistakes. You rarely, if ever, try to speak English to real English speakers because you are afraid of making mistakes, so of course, you never improve. Many of you are ready to give up. DON'T! You CAN do it. Remember, even the "greats" had to fail and pick themselves up again. Just take it one step at a time. Remember that LIFE IS RISK. If you don't try, you can't possibly succeed. If you don't jump into the water, you will never learn how to swim. Of course you will make mistakes. Accept this and get over it. If you live in a city like Vancouver, Montreal, Toronto, New York, San Fransisco, Chicago, Los Angeles, London, Sidney and many others half the people you speak to will have an accent. They will probably be making mistakes with their English too. That is the kind of world we live in now. Cities are fmulticultural. They're full of people from somewhere else. We all have to learn how to get along with one another whether or not we have an accent, or make grammar mistakes. So, talk to yourself in the mirror. Conduct entire conversations with yourself. You won't find a better listener! You can even play both parts and practice new vocabulary and pronunciation at the same time. Believe me, it works. That's exactly what I did when I was learning how to speak English. I started improving right away. I gained a lot of confidence, which started the ball rolling in the right direction. I started speaking more and better English. My vocabulary improved and I began to be able to express my ideas much more fluently and naturally. Take a risk. Dive into that pool. Go out there and practice! practice! practice! Talk to strangers at bus stops, in elevators, in the cafeteria, in stores, in the doctor or dentist's office, outside of class. Talk to people in every line up you find yourself standing in in - at the supermarket, the bank, the post office, or the pharmacy. 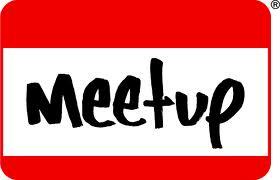 Join a meetup group in your city., or join a conversation club. 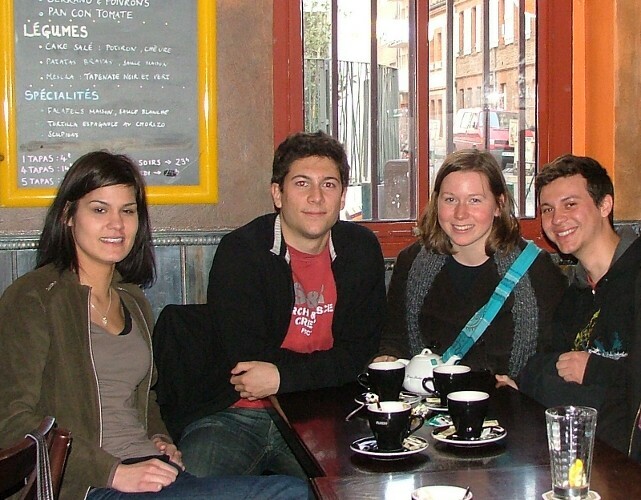 Start attending a church where you can meet English speakers who will be friendly. You don't have to be religious, or join that religion. Small churches are great because they usually have social activities, both after church and at other times. People there are very welcoming to newcomers, and nobody will force religion on you. Volunteer. Find your local volunteer centre and find a volunteer position that you are genuinely interested in. There are literally thousands of volunteer jobs just waiting for you. Stay with it. You will speak English, gain skills and make new friends. Go to dog parks and make small talk with dog owners. They absolutely love talking about their pets. Take a fun class like woodworking, flower arranging, or dance, or get involved in a sport. 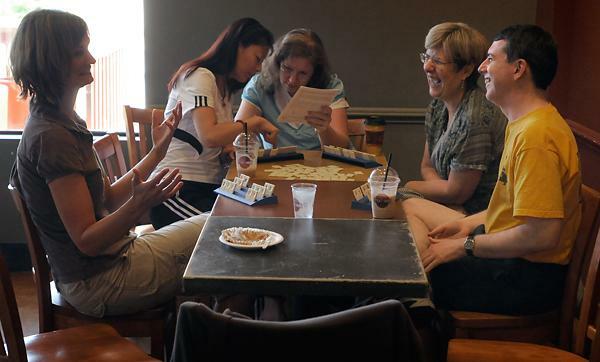 Most community centres have drop in sports leagues, or even regular leagues. You can also learn a new sport. A number of my homestay students from Japan and China have done just that and their English improved beyond their wildest dreams. Kaori, one young woman from Japan took skating lessons. Then she took up "power skating", and finally joined a mixed (men and women's hockey team where she met a ton of English speaking friends. They are still friends today even though she is back in Japan teaching English. Akiyo, another Japanese student enrolled in a scuba diving class where she actually met her Canadian husband. Still another, Junko, enrolled in a sign language course at night school. She also spoke a lot of English and made new friends. 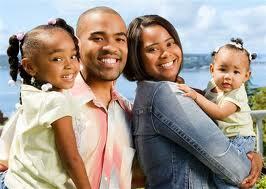 If you have young children, join a mother and children group ( they're often called mum and tot groups). You'll meet a lot of other young mothers who have a lot in common with you. Go to community centres, and playgrounds where you can talk to other mothers. If your child is enrolled in a swimming , ballet, gymnastics or any other class , talk to other parents while you are waiting for your children. If your child plays hockey, soccer, baseball, volleyball, or any other sport, talk to the other parents who will also be cheering their children on. They WILL talk back. If your child is in school, join the parent association. Parents in these associations are only too happy to talk to other interested parents. Believe me, they WILL be much more patient and understanding than you think. Whatever you do, be willing to feel uncomfortable for a while. You can't take risks and be compltely comfortable at the same time. Learn ing how to do anything involves feeling uncomfortable at first. Remember when you learned how to ride a bicycle. Where you at ease at the beginning? How about when you learned to drive? Were you comfortable? How do you feel now? Just try. You will eventually thank yourself if you keep it up. You will also improve a lot! Take it from me. I speak English like a native speaker. No one who meets me even realizes that French was my first language. Do you have any other suggestions to offer? How do you feel about this? Let me know how it goes. I love getting your comments. Many of you are Canadian immigrants or people planning to immigrate to Canada. 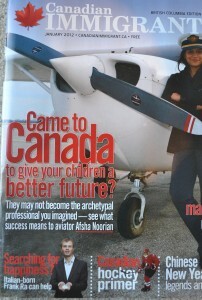 In this post, I want to promote a Canadian magazine entirely devoted to Canadian immigrants and their needs. 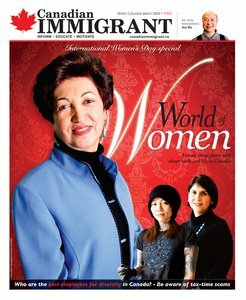 Canadian Immigrant is a monthly publication distributed in Vancouver and Toronto, but available on line to anyone interested in information related to immigrants. This magazine can be extremely useful if you want information on legal, career, education, real estate issues or Canadian culture as well as many more topics. It can also give you hope and detailed information on how immigrants can become successful once they begin to accept that they are living in a country where people do things and think differently than "back home." But, I prefer to let the publisher tell you about the magazine in his own words. "When we set about researching the concept for the magazine, our investigations revealed some startling results. One of the most significant revelations was that as immigrants leave their old role models behind, they need new positive role models — role models who can motivate them as they are settling in Canada. Our research also showed that the information needs of immigrants are broadly the same. The challenges that they face are very similar regardless of their country of origin. It became increasingly clear that immigrant settlement issues involved more than just providing a brochure on how to get Social Insurance Number cards or open a bank account. There are broader information needs to be met. That’s where our publication and website come in: we have made it our goal to help cover all the pertinent issues and challenges immigrants face, helping ease the settlement and integration process. The content consists of stories of immigrants who have faced adversity and triumphed . We hope these stories will inspire inspire you on your own journey. We also have columns from experts in fields such as immigration law, banking, careers, and real estate. estate. Our mission is to “inform, educate and motivate” every immigrant, whether they are planning to immigrate, are brand new to the country and are going through the early years of settlement or have been here for several years and are now looking for the next steps in their evolution. There’s truly something for everyone. Above all,Canadian Immigrant helps immigrants settle in Canada by providing information, tools, resources and strategies for personal growth and success. We want to help immigrants to become successful contributors to both the Canadian economy and society. Many of you have told me that you don't know enough about Canadian culture and values because you don't have enough contact with people who were born here. 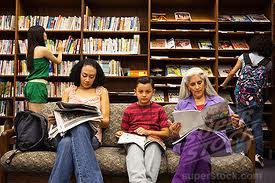 Reading Canadian Immigrant regularly is a wonderful opportunity for you to learn valuable information about the people you live and work with, and whom many of your children will marry. This month, one of the main feature stories is about post secondary education options - an issue that many of you are interested in. If you haven't heard of the magazine, or read any of its contents, I highly recommend that you visit its website and explore, not only the current issue, but also many of the articles in previous issues. You may end up having some of your many questions answered. Let me know what you think. I appreciate all of your comments. I don't think I'll be going to the movies as often as I used to. The last time I went it cost me an arm and a leg. First the tickets cost $25. Then, I paid $6.49 cents for a SMALL popcorn and $4.50 for a small bottle of WATER. To top it off, the babysitter charged us $25 for two hours of babysitting. It costs an arm and a leg = when something costs a ridiculously high price. Don't you think that $25 an hour to cut my lawn is a bit steep? That chicken sandwich was delicious, but at $12.00, it was a bit pricey. I don't think I'll come back here again. You actually bought a house in Vancouver! It must have cost a small fortune. Houses there are too expensive for most people. The prices they charge for a flight to Toronto are highway robbery. Did you know that you can fly to Hawaii for less? Wow! Look at the size of the diamond on Jane's engagement ring. Her fiance must have paid through the nose for it. One of the reasons NHL hockey tickets cost so much is because the teams have to pay top dollar for their players. Some of them even have contracts for five or six million dollars. The price of gas these days is exorbitant. I'm going to start walking to work, or riding my bicycle. Why should I pay that much to help oil companies get rich. It's not fair. Don't go to that store. The prices of everything are out of this world. The cheapest blouse in the store costs over $400. My husband and I were thinking about going on a two week vacation to Mexico, but we changed our minds. That kind of trip would definitelyy break the bank. Going out to dinner at a good restaurant is expensive, but it won't break the bank. to break the bank = to cost all the money you have in the bank. Don't tell me you didn't ask for some kind of trade in price for your new car? Wow! That car dealer must have seen you coming. such a high price for something. Do you know any more expressions that mean something is too expensive. Write and let me know. Need Any Tips on Work Etiquette? So,, here are the people from WorkEtiquette.co.uk to tell you how their site can help you. English learners have never had it so good. Ten years ago, you would have had very few opportunities to practice your listening and speaking the way you can now. As I mentioned in my last post, the voice recorder on your cell phone is a terrific tool to help you improve and practice your pronunciation, not just with the help of a teacher, but with the help of any English speaker who is willing to give you tips on how to pronounce difficult words. That same voice recorder can also help you to remember new vocabulary. Let's say you are having a conversation with someone who drops some new words, or idioms that you've never heard into the conversation. All you need to do is take out your cellphone, and ask the person you're talking to to tell the meaning of the new words. You can also ask for other examples of how the words are used. Later, you have instant access to the new words, and their pronunciation. An extra bonus is that you also have the recorded voice of a native speaker with all its correct English rhythm and intonation. Speaking into your own recorder also allows you to hear yourself as you really sound. Most of us hate the sound of our own voices the first few times we hear ourselves. But you get used to it quite quickly. In YOUR case, you can start paying attention to the actual WAY you speak. Do you sound better than you thought you would? Pat yourself on the back and give yourself a little encouragement. Are you improving your fluency? Do you sound more natural than you did a few months ago? Again. Give yourself some credit instead of constantly worrying that you aren't improving fast enough. Does your English sound choppy and unnatural? This is something you can work on improving. Do you have trouble understanding your own pronunciation - particularly the final sounds? This would be a strong indication that you really DO need to take a pronunciation class. Do you notice any specific grammar mistakes you seem to constantly make? For example, are you using the present tense instead of the past tense all the time? Are you forgetting to add the "be" to present continuous verbs? Are you forgetting to put an "s" on the end of your words when you need to? Listening to yourself in short bursts ( 2 to 3 minutes) allows you to focus on specific grammar mistakes you might want to actively work on improving. Of course, don't try to do everything at once. If you notice you aren't using proper verb tenses, focus on that one problem for as long as you need to until you feel you have it under some control. Then, you can move on to improving some other aspect of your oral grammar. In my next post, I will add a few more tips on how to use your cellphone to improve your English speaking. Let me know if you have any comments, or suggestions of your own. I look forward to hearing from you.